House MJ stands on the outskirts on a once undeveloped patch of meadow between residential houses and forest edge. The house stands detached from the road, on the slope higher up, overlooking the town of Novo Mesto. Due to the views and the configuration of the plot, the house opens towards northwest. With the slight split of levels it adapts to the terrain and at the same time separates the living from the sleeping area. The house is without corridors, the rooms can be entered from the shifted landing, which is part of the living area. 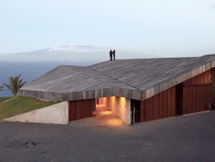 The shape of the roof allows the morning sun from the southeast to light the entrance, bathroom and the living room. 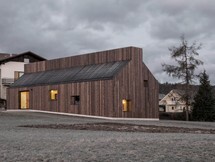 The construction is prefabricated timber frame with larch wood facade. The garage with the carport in detached from the house and stands at the street. It is dug into the slope so as not to obstruct the views from the house. Traces of wooden formwork on the exposed concrete establish a dialogue between the garage and the house.